Happy 2016! What better way to start the year than with more ways to understand your guests? This week we are releasing two new features that truly enhance your ability to gain insights on the guest experience at your hotel. Designed to be simple for self-service, our new and improved Data Exporter allows you to download the full content of both your reviews and your surveys into a single spreadsheet. You can inform your entire team about trends in your reviews by scheduling an export of data and sharing it during regular meetings. Reports are easily reformatted so you can create your own unique tables and charts. Putting data directly in your hands means you can dig even deeper on what your guests care about most. You’ll now be able to understand more of the specifics of your customers’ experiences with a new question feature in Revinate Surveys. We’ve always had conditional questions on our surveys–questions that appear only to guests who submit specific answers to certain questions. But now, you have the ability to add a conditional question that is triggered by the answer to another conditional question. This can give you quantifiable results on how many guests reported a specific issue related to an aspect of your property. Because these questions are only revealed when they are relevant to that guest, you can get deep insights without an extremely lengthy survey. Here’s a real-life example. Not all of your guests may have visited your gym, but you still want to understand, among those who did, what they liked and disliked about their experience. So, you might trigger a few questions for a guest who said they had visited the gym. 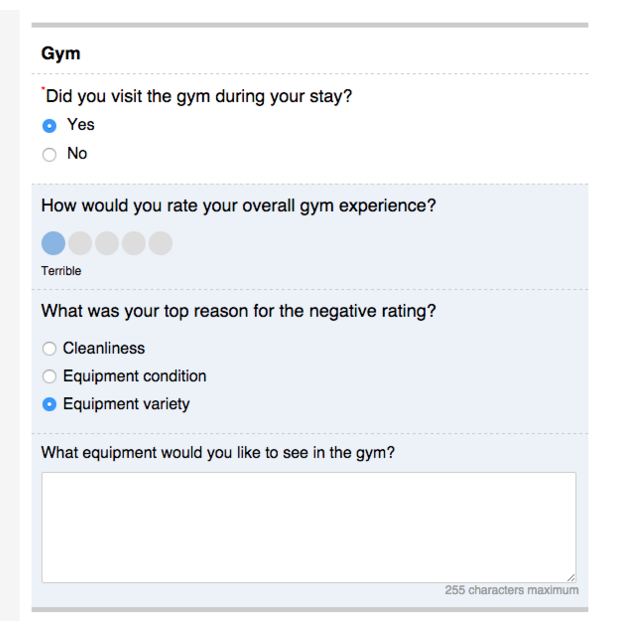 With the previous functionality of Revinate Surveys, you could activate a conditional question: for guests who said they had visited the gym, how would they rate their experience? With this new feature, you can now add another conditional question to the chain. If a guest rated their gym experience poorly, then you could trigger another question to ask them what the reason for their negative rating was. Was it the cleanliness of the facility? The equipment condition or variety? Having the ability to drill down to this level of detail about a guest’s stay is incredibly valuable insight for operational improvements and issue resolution. Log in to the Revinate app to check out these new features and start digging deep into your customer data. You can also visit the Revinate Help Desk for additional information and training on how to use them. Just needing some help in this regards. Thanks for your question. We would be happy to help you understand how to use both the new Data Exporter and Conditional-on-Conditional Survey Questions. Please reach out to support@revinate.com and our team will guide you through how to set them up for your account.